After spending three weeks as a vendor at the Saturday Magnolia Farmers Market, we’ve decided to drop out. Our crew is stretched thin already this summer, and I’ve been hobbled in various ways and unable to help with farm work. Besides going to the market on Saturday, we also have our biggest harvest of the week. We pick vegetables all day Saturday to bring to the Broadway Sunday Farmers Market, where every week we bring more and more produce and manage to sell almost all of it. The difference between these two markets is striking. I’ve been doing the Saturday Magnolia market by myself, in order to leave more hands on the farm to harvest for Sunday, and I’ve had lots of time each Saturday market to observe the people come and go (and not buy many of our vegetables) and I’ve been wondering what makes a market either thrive or languish. When we started at the Broadway Sunday market, back in 2007, it was the worst of the three markets we attended, even though it was the only weekend market for us, which usually would mean more people and higher sales. At that time, we were a three person farm operation, plus two unpaid spouses, and were all seriously overworked and under-slept. We often entertained the idea of dropping out of the Broadway market, but we had enough good sales days here and there that we decided to try it again the following year. Staying with the Broadway market was one of the best decisions we every made because this market has grown by leaps and bounds. The number of vendors has grown to fill the parking lot where the market is held, and the neighborhood comes out in force every Sunday, even when it’s raining, to stock up on groceries for the week. What makes the difference between these two markets? Having only been at the Magnolia market for three weeks, I’m no expert on the habits of this neighborhood, but here are a couple things I’ve noticed. Most of the shoppers at Broadway come on foot. I imagine lots of these folks don’t have cars, and/or are used to doing their errands on foot. That way, when it’s super hot or raining, they come to the market anyway, because they have to leave the house on foot in order to buy their groceries whether they are going to the QFC down the street or to the farmers market. At Magnolia, each week quite a few people told me that they’d love to buy our beautiful lettuce, but that it would have to sit in a hot car for a few hours before they got home, so they took a pass. I also saw lots of people come in from across the park or down the street who must have walked from home, but at Broadway I think the percentage of walkers is much higher. Another theory (very unscientific), is that there are more families with kids in Magnolia than in Capitol Hill (although I do see lots of babies and pregnant women on the Hill these days). Our farm grows lots of unusual vegetables, and many of our customers at Capitol Hill get very excited when the first purslane or puntarelle comes in each year because they like to try new things and don’t mind experimenting with vegetables that they might end up not liking that much. Adults without kids at home have more time and more flexibility to cook with new and different things. I saw lots of families at Magnolia picking up flats of berries and bunches of carrots – maybe our produce isn’t kid-friendly enough. Whatever the reason(s), we ultimately concluded that we simply can’t afford to spend 8 hours on a Saturday at a market where we might not make more than $400. Besides the time spent driving, setting up, and standing at the market, we also will save the time spent harvesting for the market, probably about 10-15 hours every Friday. At this time of year, when everyone’s been working full bore for three months, a little break can go a long way. For the Magnolia shoppers who I got the chance to talk to over the last few weeks, I’ll be sorry to miss you. 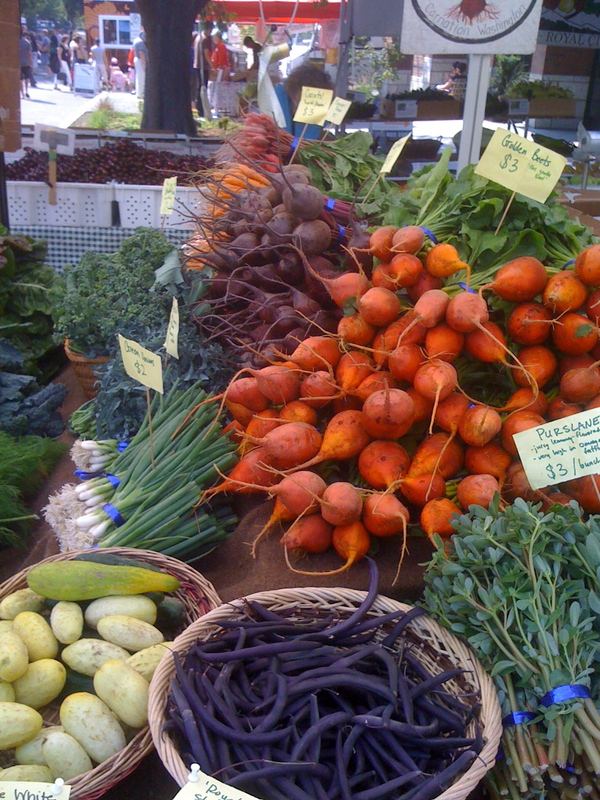 I hope you’ll come visit us at the Queen Anne market on Thursdays, and tell your friends and neighbors to get down to the market on Saturday and buy some vegetables (and cheese, and fruit, and bread, and flowers)! The market needs your support as much as you need the food you buy there. ROI is tough to figure out. When I was @seabreeze, we had a difficult time justifying a smaller market, such as Magnolia. But Jon, who was doing that market enjoyed seeing you guys, but he also made great connections with a select customer base. And those folks would routinely come out to La Boucherie for dinner. So what seemed like a slow day day could turn into profits, connections, and good times later. There are so many intangible reasons to do any individual market. Personal connections, promises of future business and whether the market has other vendors who like to trade with us – all of these reasons have tipped the scales at times in the past. This year, at this market, the intangibles don’t outweigh the true costs.